US Supreme Court imposes Shariah Law! There is voluminous analysis of today's not unexpected US Supreme Court decision that the "Hobby Lobby" chain cannot be legally obligated to provide health insurance coverage for certain kinds of contraception under the regulations of "Obamacare." Among the interesting things in the majority opinion written by Samuel Alito is extensive discussion of whether a for-profit company can represent religious expression and therefore come under the protection of religious exemptions. The government said it couldn't, the Supreme Court majority said it could (the issue was a key element of the dissent). Which is a completely natural position under Islamic law, where every activity, including commercial ones, embody religious motivations and should pursue religious outcomes. The postwar history of the West actually makes a hash of Piketty’s sweeping presumption. He argues that the years 1950 to 1970 were a “golden age” of economic equality. If so, why did the greatest period of social unrest in Europe and the United States in the 20th century come at the height of this golden age in the 1960s? If you go in thinking of the 1960s as Europe's greatest period of social unrest, you're missing a lot about 20th century European history. And to the extent that Goldberg has a point, the answer is surely that rising living standards cast light on areas where the state was complacent about inequality, like college students outside the administrative elite in France, and blacks in the US. At today's European Union Council Meeting, Angela Merkel appears to be holding a dossier probably provided by the visiting Ukrainian president which clearly shows a photo (zoomable) of a Russian automatic weapon presumably captured from Ukrainian rebels. Unlike the Syrian rebels being attacked with Russian equipment, the Ukrainian rebels don't seem to have to wait for US budget processes to get such weapons. Strange how that works. Now if we just get this ISIS hoax account to tweet something about Syria, maybe the global meeja might start covering Syria! 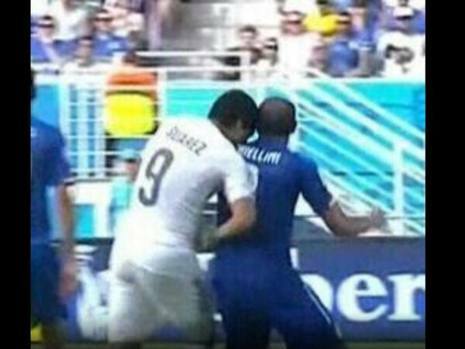 The Luis Suarez bite of Giorgio Chiellini would nicely succeed the Zidane headbutt. UPDATE: As RAI (Italian TV) has been quick to point out, there is a strange common element to the two incidents as both occurred against Italians, Marco Materazzi in the case of Zidane. Photo: La Gazzetta dello Sport. Who's that sitting with the Prime Minister of Iraqi Kurdistan, Nechirvan Barzani, today but our old friend Ahmad Chalabi. The two discussed the future of Iraq, with Chalabi apparently making various statements to give the Baghdad perspective. Juliet Eilperin [Washington Post]. Q Mr. President, you just mentioned Syria a moment ago. The United States has been slow to provide significant weapons and training directly to the Syrian opposition. Has the expansion of the Syria war into Iraq changed your mind about the type of weapons and training we’re now willing to give the opposition there? Is that what prompted Secretary Kerry to say of Syria, “We are augmenting our assistance in significant ways”? And can you elaborate on what you are you doing now that you weren’t doing before? THE PRESIDENT: That assessment about the dangers of what was happening in Syria have existed since the very beginning of the Syrian civil war. The question has never been whether we thought this was a serious problem. The question has always been, is there the capacity of moderate opposition on the ground to absorb and counteract extremists that might have been pouring in, as well as an Assad regime supported by Iran and Russia that outmanned them and was ruthless. "I think this notion that somehow there was this ready-made moderate Syrian force that was able to defeat [Syrian President Bashar] Assad is simply not true, and, you know, we have spent a lot of time trying to work with a moderate opposition in Syria," the president said in the interview taped Friday. The Islamic State of Iraq and Syria (ISIS) has already captured the Iraq cities of Tikrit and Mosul, and is battling near the capital, Baghdad. The crisis has raised questions about U.S. reticence in Syria last year, when opposition forces - and some members of Congress - were pleading for active engagement and arms support amid mounting evidence that Assad had used chemical weapons against his own civilians. "When you get farmers dentists and folks who have never fought before going up against a ruthless opposition in Assad," Mr. Obama continued, "the notion that they were in a position to suddenly overturn not only Assad but also ruthless, highly trained jihadists if we just sent a few arms is a fantasy. And I think it's very important for the American people - but maybe more importantly, Washington and the press corps - to understand that." Two problems with that. First, if some of "few arms" had been anti-aircraft weapons, it would have deterred the barrel-bombing of Aleppo. And second, if he thought it was such a weak opposition, why did the US draw it into the useless Geneva peace talks knowing that Assad was winning on the battlefield and therefore had no incentive to negotiate? If the moderate opposition was having to argue with extremists who say that Jihad is the only solution, and all they can offer is failed peace talks and a non-response to a chemical weapons attack, then they lose the argument. In Vox, Dylan Matthews presents 6 numbers that show the costs of the 2003 US invasion of Iraq. They are at least 126,000 civilian deaths, 4486 US servicemember deaths, 2 million refugees, trillions in total budgetary costs, an Iraq no freer than Iran, and 0 WMDs. That's all true. But Syria -- the multi-sect multi-ethnic Baathist dictatorship where the US has not intervened -- is worse in all aspects that don't pertain to costs to Americans. There are more civilian deaths, more refugees, more political repression, and WMDs have not only been identified, but used. And that's before trying to put a number on the existential threat the Syria crisis poses to 4 countries: Syria, Iraq, Lebanon, and Jordan. So the costs of Iraq as documented are certainly relevant to a US decision whether or not to intervene somewhere again. But they're only part of a global calculation of when an intervention might be worth it. We give up. This concludes our series of posts noting articles, as it happens in Vox but not originally intended that way, about the situation in Iraq that are apparently oblivious to the crisis in Syria. Note how Vox names the storystream. There is a deep, deep, reluctance to acknowledge the links between the two disasters. Too many narratives have to be dumped if they are taken together. Nothing elsewhere in the column refers to the UAE, nor does it offer any criteria which would single out the UAE -- the most active financial backer of the Sisi government in Egypt -- as meriting particular support. If the criteria are a Gulf country with sectarian harmony and proximity to democracy, the worthy country would be Kuwait. But Kuwait doesn't have a flashy airline. 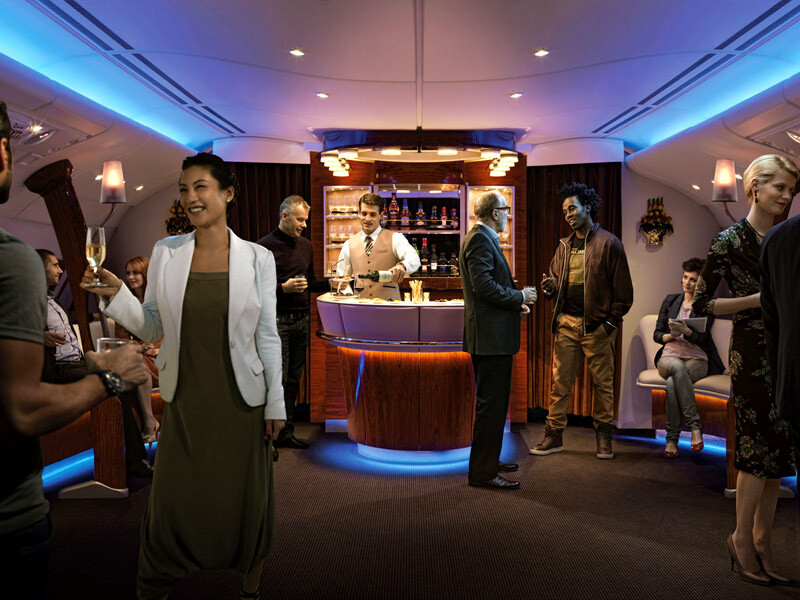 Photo: Emirates First Class cabin bar. A continuing series in which we note articles that manage to discuss the Iraq/ISIL crisis without ever mentioning the word "Syria." It must be a Vox thing because Matthew Yglesias is today's exhibit. Both Mr. Kagan and his brother are taking considerable pains to describe their advocacy as broadly bipartisan. “The urgent priority is to unite internationalists on both sides of the spectrum,” said Fred Kagan, while his brother, Robert, mentioned his briefing of a bipartisan congressional delegation at Davos and his good relations with top White House officials, including the national security adviser, Susan E. Rice. Can you get a F for a commencement speech? And the need for a new strategy reflects the fact that today’s principal threat no longer comes from a centralized al Qaeda leadership. Instead, it comes from decentralized al Qaeda affiliates and extremists, many with agendas focused in countries where they operate. And this lessens the possibility of large-scale 9/11-style attacks against the homeland, but it heightens the danger of U.S. personnel overseas being attacked, as we saw in Benghazi. It heightens the danger to less defensible targets, as we saw in a shopping mall in Nairobi. So we have to develop a strategy that matches this diffuse threat -- one that expands our reach without sending forces that stretch our military too thin, or stir up local resentments. We need partners to fight terrorists alongside us. And empowering partners is a large part of what we have done and what we are currently doing in Afghanistan. 1. The Islamic State of Iraq and the Levant (ISIL) is not al Qaeda affiliate. 2. There are no US personnel (that we know of) in areas under ISIL control. 3. ISIL is not a diffuse threat: it has specific territory that it wants to hold. 4. ISIL operates in 2 countries and it wants to create a new country, so it's not clear what the significance of the clause "countries where they operate" is. 5. ISIL hasn't attacked "less defensible targets" -- it has attacked the Iraqi army head-on. 6. The locals in the areas it has acquired resented the Iraqi government more than ISIL. 7. The US partner in attacking ISIL would be ... the Iraqi government. But other than that, it was a perfectly good speech. The simple and fundamental fact is that this is the fallout of the 2003 invasion of Iraq. Any analysis that doesn't grapple with and accept that basic fact is just wrong and possibly dishonest to boot. ... Circling back, this is the upshot of the decision made in March 2003. There is no other realistic or honest way to understand it. The outbreak of a shattering Civil War in Syria only upped the stakes massively. If only we had an example of a country with a Ba'athist dictator that the US didn't invade to see what Iraq without the 2003 invasion might look like! It's surprising that amid all the searches for a grand unified theory of the Iraq-Syria fiasco, there isn't much focus on the historically obvious link between the countries: Ba'athism. The other major historical link is through the failed transplantation of the Hashemite monarchies in each country -- which also serves to illustrate the continuing paradox of the Arab political world, that the modern monarchies have held up far better than the supposedly modernizing presidential systems. Anyway, as Maureen Dowd might say, Barack Obama came into office sure that the one way he could outperform George Bush was in not having his foreign policy legacy defined by a Ba'athist dictator -- only to end with his foreign policy legacy defined by a Ba'athist dictator. As is the way of such things, the headline gets repeated and embellished. It's obviously difficult to fact-check everything coming out from Iraq, but there are some details here that could be challenged. Mosul doesn't have a central bank, because it's not the capital of Iraq. It does have a branch of the Baghdad-based Central Bank of Iraq, but it stretches credulity to think that a central bank branch would have that much cash on hand. The story then bobs and weaves about whether the money was robbed from the central bank or commercial banks, but reports on the ground in Mosul say that ISIS is not robbing banks and indeed is guarding them to ensure that they open. The United States has been fast to provide necessary support for the people and government of Iraq under our Strategic Framework Agreement, and we are working together to roll back aggression and counter the threat that the Islamic State of Iraq and Levant poses to the people of the region. The situation inside the upper reaches of US policymaking seems to be better captured by the Wall Street Journal headline Iraqi Drama Catches U.S. Off Guard. The biggest reach of all, but also the best thing for Iraq: a constitutional amendment that redefines Iraq's executive authority, with security and foreign affairs under the president, and the economy and domestic politics under the prime minister. But Iraq under Saddam Hussein and his predecessors also had a "perfectly fine constitution" that had "no bearing on the conduct of the state," said Kenneth M. Pollack, a former Bush and Clinton administration staffer now at the Brookings Institution Saban Center. UPDATE: Pollack has apparently been saying similar things about a weapons-for-constitutional-amendments deal directly to the US government. In particular, the LAS (Arab League) and the EU call on the Government of Iraq and the Government of the Kurdistan region to combine their political and military forces in order to restore security to Mosul and Nineveh. So their proposed solution is Kurdish participation in an assault on the 2 provinces bordering the autonomous Kurdish region, and in which Kurdistan would have the proximity and the morale to maintain control -- unlike the Iraqi security forces. Haven't the very serious ministers therefore essentially called for an expanded Kurdistan as a bulwark to the absence of control in northern Iraq? What could possibly go wrong? UPDATE: The Kurds didn't wait long to cash in their chips. They've taken over Kirkuk. Vox has a really excellent explanatory interview with Mari Steed on the Irish Mother and Baby Homes scandal. One point may be worth observing about this period. When 1940s governments in Ireland started to take on the country's atrocious public health outcomes (which were magnified in these homes), the opposition came in equal parts from the Catholic Church and the doctors -- and given the esteemed occupations in Ireland at the time, that was a tightly knit and well connected alliance. Eventually the country got the basics of a national health provision system in place, although some of the features of the opposition from that era, such as preserving the role of private medical practice in the public system -- still haunt it today. Luckily also, Ireland eventually moved on from its deference to priests and doctors and elevated bankers and financial consultants in their place, and we all lived happy ever after. There was euphoria a couple of weeks ago when the bad old 2008 days of Irish, British and Icelandic banks rushing to the Gulf in a desperate search for capital had given way to ... German banks rushing to the Gulf in a desperate search for capital. At the time we wondered whether the new Qatari investor in Deutsche Bank -- Sheikh Hamad bin Jassim -- was being lent the money by Deutsche Bank to buy his stake. It turns out that everyone has learned enough from the Barclays, Kaupthing and Anglo affairs to know that the bank shouldn't lend money to a share buyer. But at least Sheikh Hamad is not involved in any of that dodgy World Cup 2022 business, right? The Telegraph has what appears to be further substantive revelations about the collapse of the various Chinese Walls that were supposed to separate the Qatar World Cup bid from FIFA executives; in this case Michel Platini. In fact the article ignores one other angle: the current funding scandal involving Sarkozy campaign expenses that were billed to the UMP is centered around the Bygmalion PR firm which has substantial links to Qatar and in particular to Sheikh Hamad bin Jassim, then PM and Foreign Minister of Qatar. The lowest 10% of earners pay three times as much as a share of their income for electricity compared to the middle class. If you want more inequality, this is an ideal way to ensure it. Shouldn't we therefore redistribute more income from the rich to the poor so that necessities like electricity don't take up as much of the latter's income? By the way, I’m not accusing Mr. Giles of being a hired gun for the plutocracy, although there are some self-proclaimed experts who fit that description. And nobody’s work should be considered above criticism. But on politically charged issues, critics of the consensus need to be self-aware; they need to ask whether they’re really seeking intellectual honesty, or are effectively acting as concern trolls, professional debunkers of liberal pieties. I am sure that the power of vested interests is vastly exaggerated compared with the gradual encroachment of ideas. Not, indeed, immediately, but after a certain interval; for in the field of economic and political philosophy there are not many who are influenced by new theories after they are twenty-five or thirty years of age, so that the ideas which civil servants and politicians and even agitators apply to current events are not likely to be the newest. But, soon or late, it is ideas, not vested interests, which are dangerous for good or evil. It's not much of a leap to note that the European and US decision to let Syria fester was always likely to lead to connections like the Brussels Jewish Museum attack, which appears to be linked to a French national, Mehdi Nemmouche, with jihadi experience in Syria. Diplomats close to Assad acknowledge that part of his strategy has been to overlook the presence of the Islamic State of Iraq and the Levant (ISIL), an al-Qaeda division led by foreign jihadists, who have been fighting the moderate rebels - the first to rise up against the Syrian leader's rule. "It’s a logical strategy. Why attack ISIL if ISIL is attacking your enemy?," one Arab diplomat said. That's just the latest of months of conclusions including from the rebels themselves that ISIL has the tacit tactical support of the Assad regime. Latest Brussels Jewish Museum attack revelation: the suspect's jihadi experience was with ISIL. Will the New York Times ever stop tantalizing us with hints about Barack Obama's expletives deleted? Tom Friedman -- words he reportedly uses privately to summarize the Obama doctrine: “Don’t Do Stupid Stuff” (with “stuff” sometimes defined more spicily). The only solution, they [Kurds] say, is for the U.S. and Russia (how likely is that!) to broker a power-sharing deal in Syria between Saudi Arabia, Turkey, Iran and their proxies. Repeat after me: There is no military solution to Syria — and Iran and Russia have to be part of any diplomatic one. Those are the kind of unpleasant, unromantic, totally long-shot foreign policy choices the real world throws up these days. A little humility, please. To be fair to the Moustache, he's not a novice on Syria. He was in Hama after the Hafez al-Assad flattened it with at least 10,000 people under the bombs and bulldozers. But anyway, the point here is the following: note how his solution, which is very much of a consensus solution in elite foreign policy circles, only involves one Arab country with multiple non-Arab players, and doesn't involve talking to actual Syrians at all! In the Irish coverage of the Republic of Ireland vs Italy World Cup warm-up, the fact that Riccardo Montolivo broke his leg after a tackle from Alex Pearce is merely an incidental detail. For the Italian coverage, it's the main story.